DENVER – Colorado’s primary elections were held Tuesday, and hundreds of thousands of Coloradans cast their vote for the Democratic and Republican nominees in the gubernatorial race, congressional races and other statewide races. Denver7 had a running live blog of updates throughout the afternoon and into the night as races were decided. Scroll back through the updates for our coverage through the evening. We are signing off for the night, but you can scroll back through our coverage for more information. Read our story about the gubernatorial primaries here . Read about the congressional district primaries here. Denver7 will have more coverage starting Wednesday morning at 4:30 a.m.
We also expect to have stories on the still-undecided Democratic primary in the attorney general's race between Phil Weiser and Joe Salazar—who as of 10:30 p.m. were separated by about 12,000 votes, with Weiser in the lead—the primaries in the state Senate and House races and the primaries in the state treasurer's race. Watch our full 10 p.m. coverage in the player below and thanks for tuning in! Our wrap-up on the primaries in Colorado's Congressional District races can be found here. Our story on Jared Polis and Walker Stapleton clinching their respective party's nominations in the gubernatorial race can be found here. Diane Mitsch Bush has clinched the Democratic nomination in Colorado’s 3rd Congressional District and will face Rep. Scott Tipton in November. She so far has 64 percent of the vote over Karl Hanlon and Arn Menconi. And Karen McCormick has clinched the Democratic nomination in Colorado’s 4th Congressional District and will face Rep. Ken Buck in November. McCormick so far has 65 percent of the vote over Chase Kohne. Rep. Jared Polis has already clinched the nomination and at 44.5 percent, he currently leads Cary Kennedy (25 percent), Mike Johnston (23.1 percent) and Donna Lynne (7.3 percent) in the Democratic gubernatorial primary. Walker Stapleton has already clinched the nomination and at 48.5 percent, he currently leads Victor Mitchell (30.5 percent), Greg Lopez (12.3 percent) and Doug Robinson (8.7 percent) in the Republican gubernatorial primary. Rep. Diana DeGette defeated Saira Rao in the 1st Congressional District Democratic primary and currently leads 72.1 percent to 27.9 percent. Joe Neguse defeated Mark Williams in the 2nd Congressional District Democratic primary and currently leads 66.4 percent to 33.6 percent. Diane Mitsch Bush (64.4 percent) leads Karl Hanlon (27.6 percent) and Arn Menconi (8 percent) in the 3rd Congressional District Democratic primary. Jason Crow defeated Levi Tillemann in the 6th Congressional District Democratic primary and currently leads 67.5 percent to 32.5 percent. Brian Watson (38.4 percent) leads Justin Everett (36.5 percent) and Polly Lawrence (25.2 percent) in the Republican state Treasurer primary. Phil Weiser (51.3 percent) leads Joe Salazar (48.7 percent) in the Democratic attorney general primary. Watch the acceptance speech from Democratic gubernatorial nominee Jared Polis here or in the player below. Watch the acceptance speech from Republican gubernatorial nominee Walker Stapleton here or in the player below. In Stapleton’s victory speech, he thanked his opponents for a “spirited campaign” and says he’s “ready for unity.” He thanks his wife, kids, sister, parents and campaign staffers as well. “Most importantly though, thank you to my fellow Coloradans for your trust and support tonight,” Stapleton said. “Onward to victory in November!” he said to end his speech. We're anticipating hearing from Republican gubernatorial nominee Walker Stapleton shortly. You can watch live in the player below. Joe Neguse has clinched the Democratic nomination for Colorado’s 2nd Congressional District seat, which is being vacated by Jared Polis, who just won the Democratic gubernatorial nomination. He currently leads Mark Williams 66.6 to 33.4 percent. In his victory speech, Jared Polis thanks the other three candidates, saying they were inspiring and brought passionate volunteers. He said he'll "continue working with them to make sure each of them can help the people of Colorado." He said it was an "honor" to be picked and said, "Together we're going to make Colorado even better, even stronger." "I could not be more humbled to be your Democratic nominee for governor of Colorado," Polis says. He says that, "Even though we're celebrating tonight, we know we're not there yet. We have to go up against Walker Stapleton. He has a starkly different vision for our country and state." He says, "We will win in November." Jared Polis is set to give his victory speech after clinching the Democratic gubernatorial nomination. He's also receiving congratulations from the party. Jason Crow has clinched the Democratic nomination in the 6th Congressional District and will face Rep. Mike Coffman in November. Incumbent Rep. Doug Lamborn has clinched the nomination in Colorado's 5th Congressional District Republican primary. Current numbers show Lamborn leading with 53.7 percent of the vote. Darryl Glenn is second with 19.6 percent. Owen Hill is third with 17.6 percent. Bill Rhea is fourth with 5.8 percent, and Tyler Stevens is fifth with 3.3 percent of the vote. The Associated Press has called the Democratic gubernatorial primary for Jared Polis. Polis leads with 43.1 percent currently. Kennedy is second with 25.5 percent. Johnston is third with 23.9 percent, and Donna Lynne is fourth with 7.5 percent. Incumbent Rep. Diana DeGette has clinched the nomination in Colorado's 1st Congressional District over Saira Rao. With 76,202 votes counted, she has 72.6 percent of the vote to Rao’s 27.4 percent. 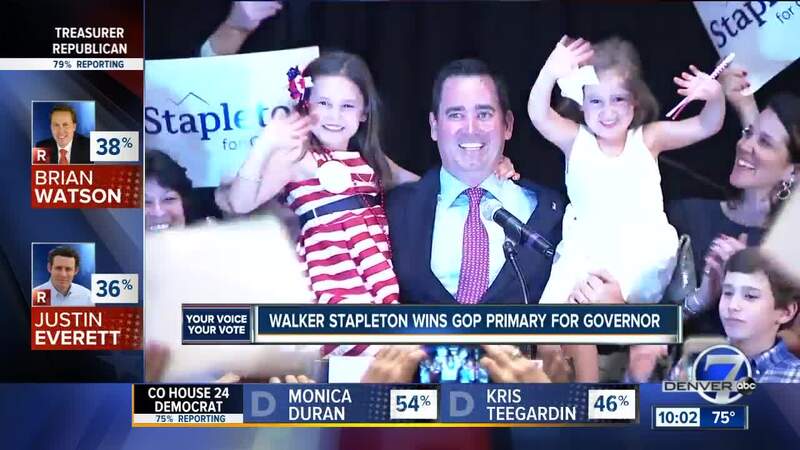 Walker Stapleton tweets after clinching the Republican gubernatorial nomination. "Thank You Colorado! Together, we have taken one giant step toward taking back the Governor's Office. Onward to victory in November!" Doug Robinson tweets that he's already called Stapleton to congratulate him. He says Stapleton will have his support in November. The Republican Governors Association sent an email congratulating Stapleton. Denver7 and The Associated Press have called hte Republican gubernatorial primary for Walker Stapleton. Current numbers from the Secretary of State’s Office show Stapleton leading with 48.8 percent of the vote. Trailing him are Victor Mitchell (30.7 percent), Greg Lopez (11.8 percent) and Doug Robinson (8.7 percent). Rep. Jared Polis (41.9 percent) leads Cary Kennedy (25.9 percent), Mike Johnston (24.4 percent) and Donna Lynne (7.8 percent) in the Democratic gubernatorial primary. Waker Stapleton (49.2 percent) leads Victor Mitchell (30.5 percent), Greg Lopez (11.7 percent) and Doug Robinson (8.6 percent) in the Republican gubernatorial primary. Rep. Diana DeGette leads Saira Rao 72.7 percent to 27.4 percent in the 1st Congressional District Democratic primary. Joe Neguse leads Mark Williams 68.2 percent to 31.8 percent in the 2nd Congressional District Democratic primary. Diane Mitsch Bush (60.4 percent) leads Karl Hanlon (31.7 percent) and Arn Menconi (7.9 percent) in the 3rd Congressional District Democratic primary. Rep. Doug Lamborn (54.1 percent) leads Darryl Glenn (19.6 percent), Owen Hill (17.4 percent), Bill Rhea (5.7 percent) and Tyler Stevens (3.2 percent) in the 5th Congressional District Republican primary. Jason Crow leads Levi Tillemann 67.1 percent to 32.9 percent in the 6th Congressional District Democratic primary. Brian Watson (39 percent) leads Justin Everett (35.7 percent) and Polly Lawrence (25.3 percent) in the Republican state Treasurer primary. Phil Weiser (50.2 percent) leads Joe Salazar (49.9 percent) in the Democratic attorney general primary. With 65,000 votes counted in the 5th Congressional District Republican primary, incumbent Rep. Doug Lamborn leads with 54.1 percent. Darryl Glenn in second with 19.6 percent; Owen Hill third with 17.4 percent; Bill Rhea fourth with 5.7 percent and Tyler Stevens is fifth with 3.2 percent. Rep. Jared Polis (40.3 percent) leads Mike Johnston (26.2 percent), Cary Kennedy (25.8 percent) and Donna Lynne (7.7 percent) in the Democratic gubernatorial primary. Waker Stapleton (50.6 percent) leads Victor Mitchell (28.2 percent), Greg Lopez (11.1 percent) and Doug Robinson (10 percent) in the Republican gubernatorial primary. Joe Neguse leads Mark Williams 70 percent to 30 percent in the 2nd Congressional District Democratic primary. Diane Mitsch Bush (65.4 percent) leads Karl Hanlon (28 percent) and Arn Menconi (6.6 percent) in the 3rd Congressional District Democratic primary. No results yet for the 5th Congressional District Republican primary. Jason Crow leads Levi Tillemann 67.5 percent to 32.5 percent in the 6th Congressional District Democratic primary. Brian Watson (38.1 percent) leads Justin Everett (36.2 percent) and Polly Lawrence (25.8 percent) in the Republican state Treasurer primary. Phil Weiser (52.4 percent) leads Joe Salazar (47.6 percent) in the Democratic attorney general primary. Polls are officially closed in Colorado! Stay updated with this blog, and check election results here . You can also find election results on the Secretary of State's website. The first results are expected to start coming in around 7:15 p.m.
Secretary of State's Office spokesperson Lynn Bartels provided updated active voter registration numbers. There are 3,247,689 total active voters. Among them, 1,023,036 (31.5%) are Democrats; 1,004,341 (30.9%) are Republicans; and 1,220,312 (37.6%) are unaffiliated. Turnout as of 4:10 p.m. would be as follows: 30.3 percent of all active voters (though third-party voters cannot participate in the primaries); 37.6 percent of Democrats; 36.1 percent of Republicans; and 19.3 percent of unaffiliated voters. The highest percentage turnout for a recent Colorado primary came in 2010 , when there was 32.36 percent turnout. We have updated numbers as of 4:10 p.m. from the Secretary of State's Office. There have been 983,703 ballots returned as of 4:10 p.m. Of those, 385,470 (39.2 percent) came from Democrats; 362,590 (36.9 percent) came from Republicans; and 235,643 (24 percent) came from unaffiliated voters. The polls close at 7 p.m., so there is still time to vote. If you're still hoping to drop your ballot off or hit a polling location on the way home, here are some resources. Here is the election results page , which will start updating at 7 p.m. MT as polls close and results start coming in. 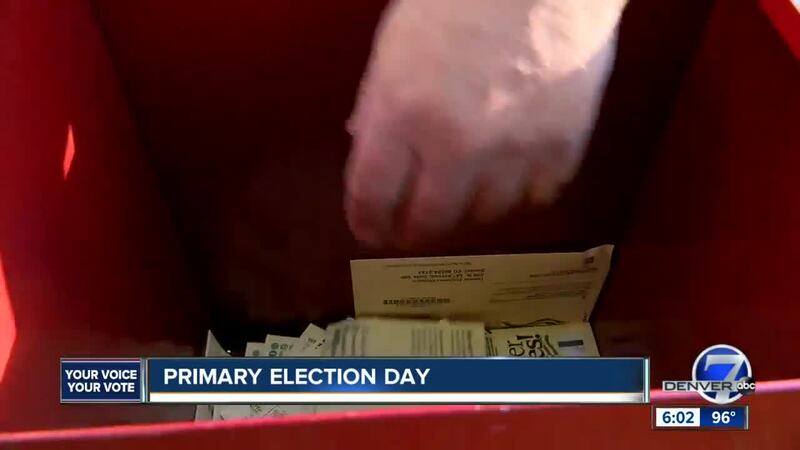 Due to a printing issue from a vendor, Montrose County will be hand-counting ballots today. The county clerk says that the final tally for the county likely won't come until Thursday or Friday. As of noon Tuesday, 881,976 Coloradans had voted—up from the count of 833,638 that was made Tuesday morning. The party breakdown as of Tuesday morning's numbers was: 38.9 percent Democrats; 37.3 percent Republicans and 23.8 percent unaffiliated voters. The unaffiliated voting numbers show more have selected Democratic ballots so far than Republican ballots—a trend that has continued over the past week.